Our family is Christian. We love God and Christmas is a special opportunity for us to focus on how we can show God’s Love, and that Love is what this post is about. This Love comes with a big responsibility. It means we need to love and respect others, even when we don’t feel like it, or if we disagree with them. It means we have to be good stewards of this earth, so our great-great-great-grand kids get a chance to enjoy it as much as we do. This Love, also tell us that no matter what the ethnicity, nationality, religious beliefs, political views or sexual orientation we have, we all deserve respect, and we all have a responsibility to work together to leave this world a better place than we entered into. There has been so much bad news lately, and so much hatred and fear in so many parts of the world. So much, that it seems overwhelming to many of us. However, if we can remember that Love and respect start at home, we CAN make a difference. Give a stranger a sincere compliment, or even a hug. Donate a few hours at a homeless shelter, or a few dollars to build a well in Africa, or a coat to keep a child warm. Tell your children about kids in other parts of the world. Show them pictures of how these kids live, then tell your kids, that, just like the kids in the pictures, they are Loved. Send care packages to refugees, or servicemen and women stationed overseas. Invite that uncle, with political views totally different from yours to Christmas dinner, and talk about all the things you do agree. Tell the people in your lives that you Love them! Whether you agree with me religiously or politically, or not, I am pretty sure you agree that the world should be a more Loving place. And it starts with me and my family, and you and your family! and Many Wishes of a 2016 Surrounded by Love!! We will probably take the next week off, so we will see you in 2016! Here is the card with the Star Wars snowflake cut-out folded up. Here is the back, featuring our kids. The concept, photos, design and text are all © Anette Nam Design. 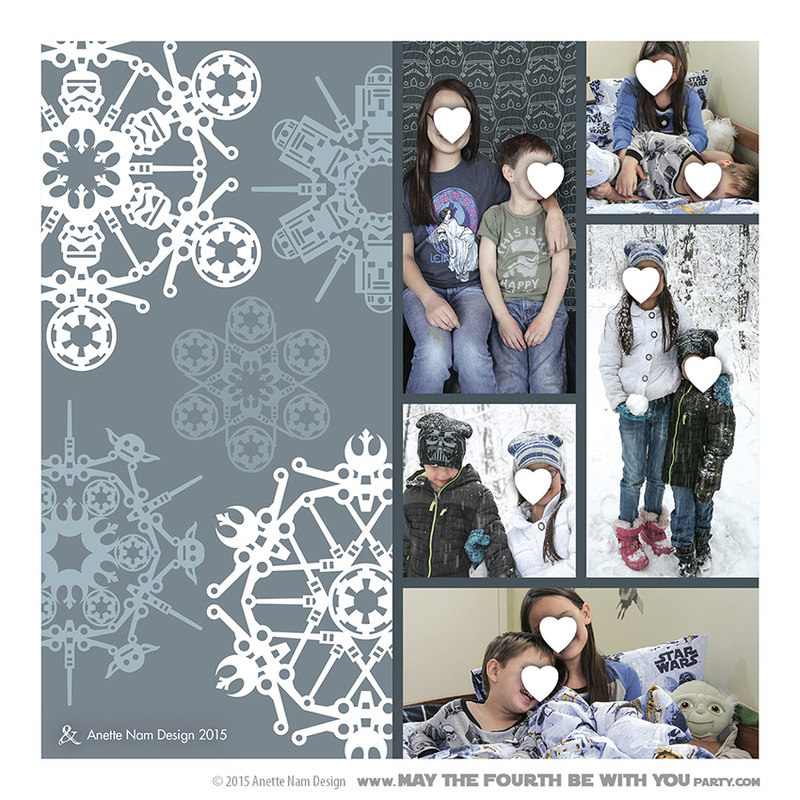 The snow flakes are all exclusive designs, and I will share the vector art for all of the Star Wars snowflake patterns with y’all in plenty of time for next winter and Christmas. The front snowflake was cut out using an Silhouette Cameo. And lastly, the Silhouette Cameo cutter is also from Amazon…. Boy do I love that thing. ← Is The Force Awakens OK for Kids? Thank you! We really had fun designing it.